Back In The Gi » Blog Archive » Belt requirements in different branches of Goju-ryu. Belt requirements in different branches of Goju-ryu. There are several schools or branches of Goju-ryu that have diverged from each other in various ways since the death of Chojun Miyagi. Although they all retain the major elements of the style, they do differ in some notable ways. For example, they are distinct is in the ranking systems that they use in terms of the kata requirements for each belt. 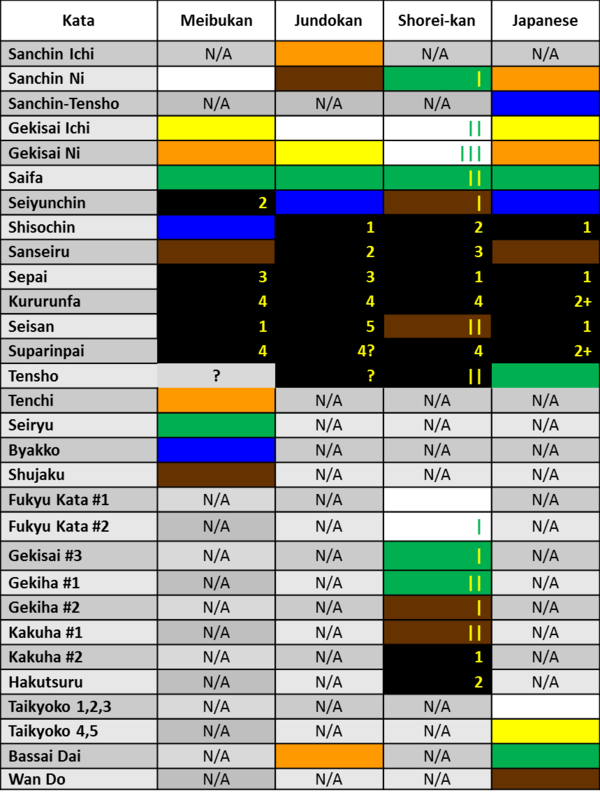 I have compiled a table that summarizes the belt requirements from the four major schools (three Okinawan: Meibukan, Jundokan, and Shorei-kan; plus Japanese). Some of the details undoubtedly vary within each school, either by organization or even by dojo, but this is still an informative comparison. Additional notes are provided after the table. Sources: Guelph Budokan Centre for Martial Arts (Meibukan), Asahi Martial Arts Academy student manual, which was part of the Yudansha Kobujitsu Karate-doh Federation (Jundokan), Shorei-kai Canada (Shorei-kan), Don Warrener’s Martial Arts Academy student manual (Japanese). The belt requirements may differ somewhat within your particular organization or dojo. 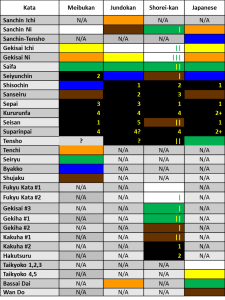 Shorei-kan uses a white-green-brown-black ranking system, which is more common in Okinawa than in the West, where some variation of the multi-colour system is most common. Sanchin Ichi is a version of the kata developed by Chojun Miyagi that does not include turns. Sanchin Ni is the original version of the kata taught by Kanryo Higaonna which includes turns. Meibukan, Shorei-kan, and Japanese Goju-ryu each include katas unique to their schools that are not part of the core Goju-ryu system. Taikyoko 1,2,3 refers to the kata Taikyoko Gedan, Taikyoko Chudan, ans Taikyoko Jodan. Taikyoko 4,5 refers to Taikyoko Mawashi Uke and Taikyoko Kake Uke. These all follow the same pattern but use a different block. A similar pattern is found in the Meibukan exercise of kakomi kumite. Sanchin-Tensho is also performed by Meibukan students but is not necessarily part of the main syllabus. Here is an example of the kata performed by Meitatsu Yagi. There are several spellings for many of the kata names.